I am an Ambassador for the 26.2 with Donna. I am not monetarily compensated for this role, nor was I compensated to write this post. I may receive free products and invitations to events on occasion, but I am primarily compensated with warm fuzzies. All opinions expressed here are 100% mine. This post contains affiliate links. 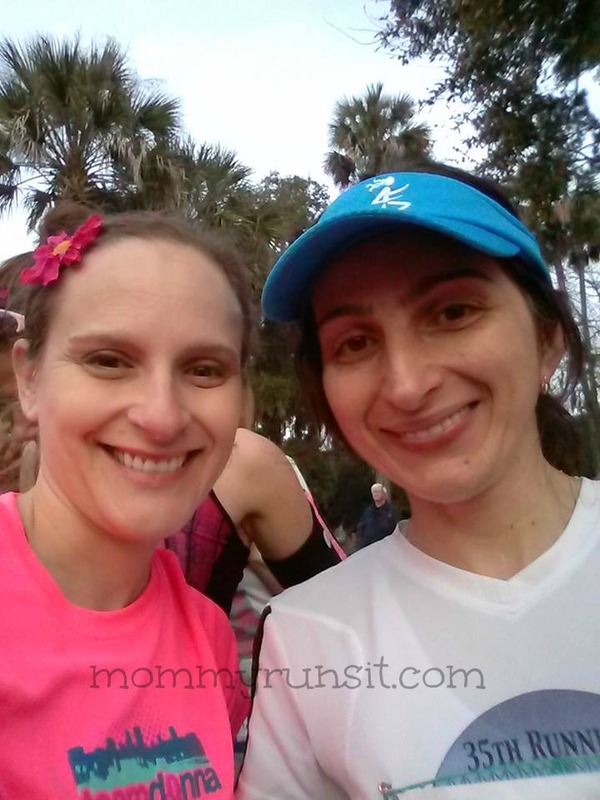 On February 23, 2014, I ran my 2nd marathon – the 26.2 with Donna in Jacksonville, Florida. 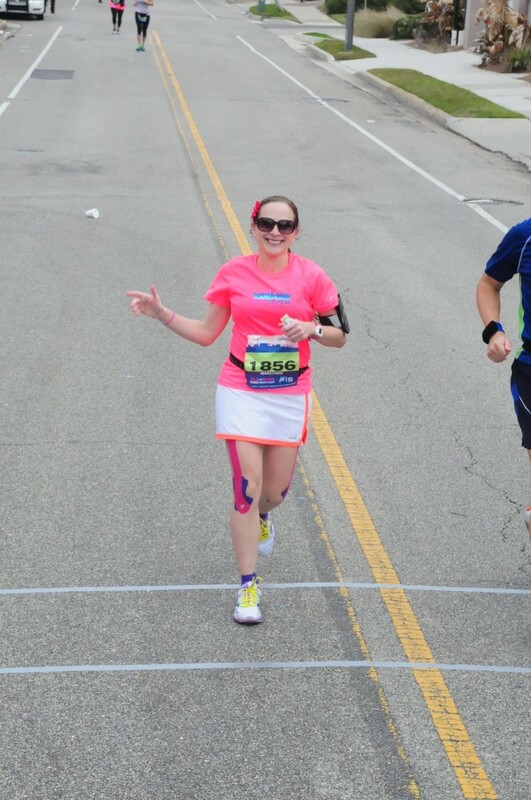 Yes, I’m recapping the race over a month after it happened. But unless you’re new here, that shouldn’t come as too much of a surprise. I’m pathologically unpunctual. Anyway. Last month I told you about the days and weeks leading up to the 26.2 with Donna, and now it’s finally time to tell you all about the actual race. Here goes. 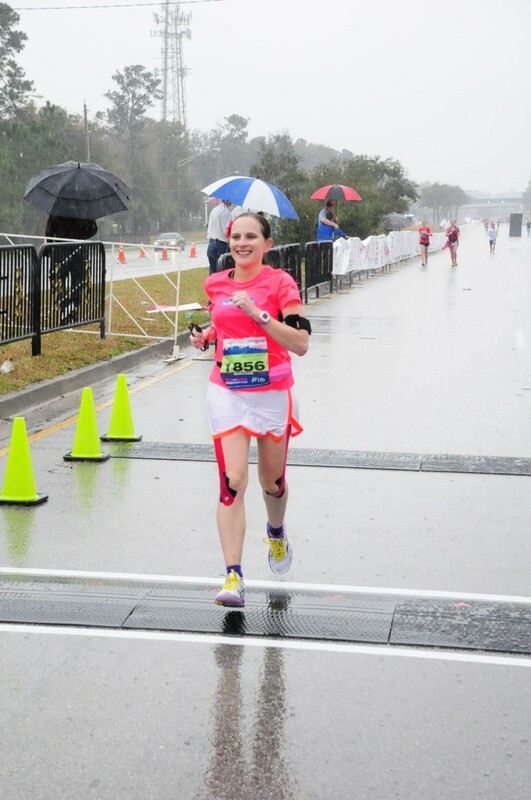 About two weeks before the race, I started obsessing worrying about the weather on race day. Let me put this into context for you. 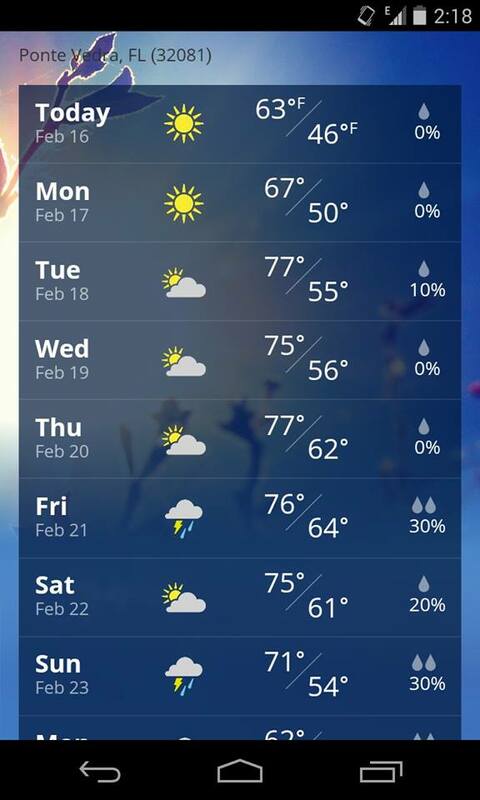 Winters in Northeast Florida are always unpredictable. We’ll have these little bursts of cold weather, followed by stretches of mild, warmer temperatures. It’s not uncommon to use your air conditioner and heater in the same week. So with that said, we really had no idea if it would be 25 degrees or 75 degrees on race day. 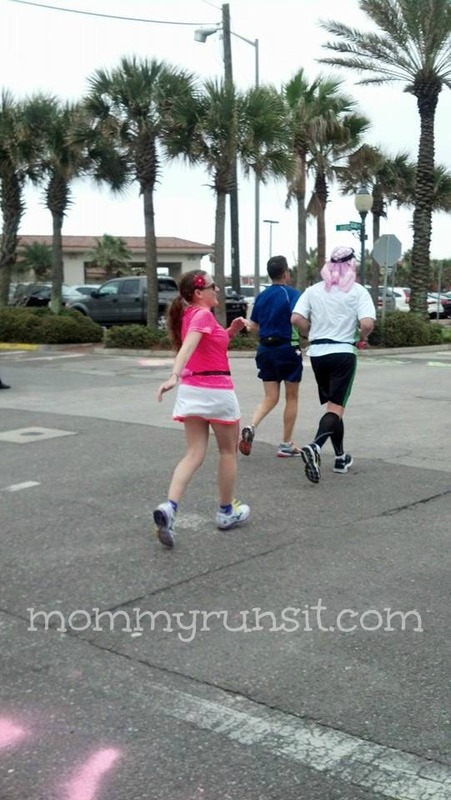 The last two Donna marathons had been extremely cold – it was about 29 degrees at the starting line in 2012 and 35 in 2013. (For you folks who are accustomed to actual winters – this is extremely cold weather to the average Floridian.) 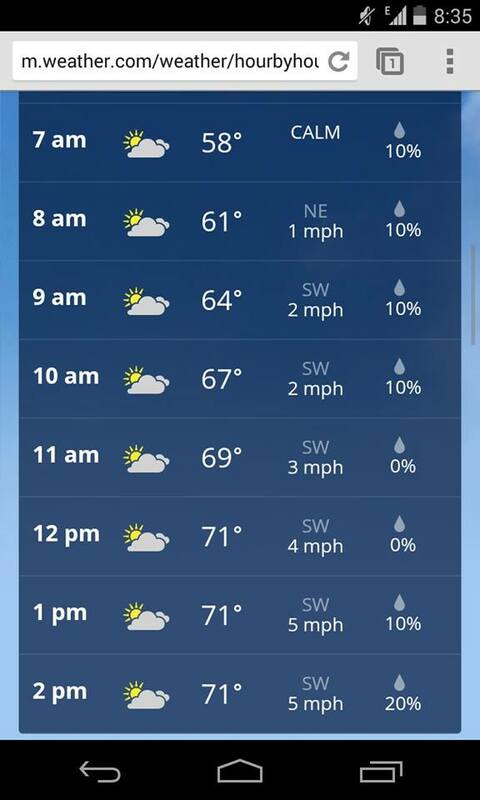 I’d heard rumors that we were going to have beautiful weather on race day. 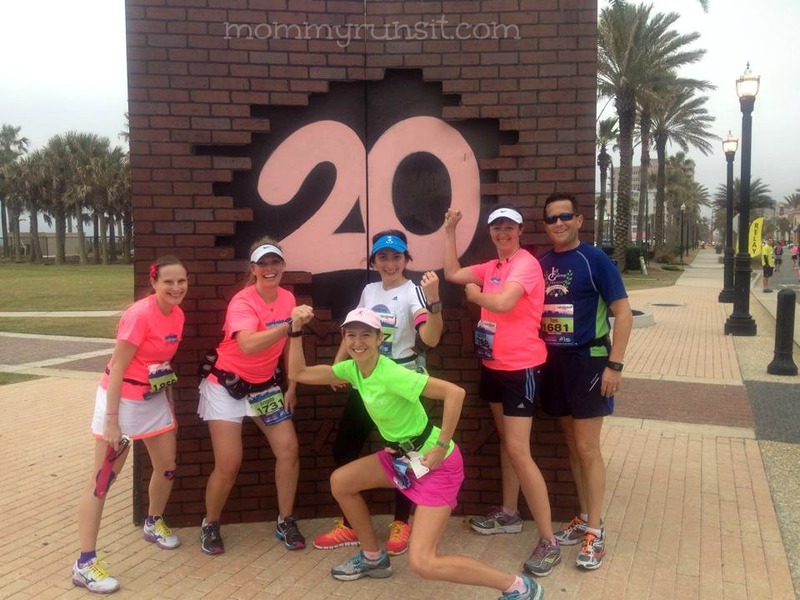 And as the race drew near and the temperatures began to rise, my running friends and I started making plans to swap our running tights and hoodies with skirts and tank tops. Rain in the forecast. Not good. I started making preparations. I bought a Dri-FIT hat to keep the rain off my head and out of my eyes. I bought a poncho. 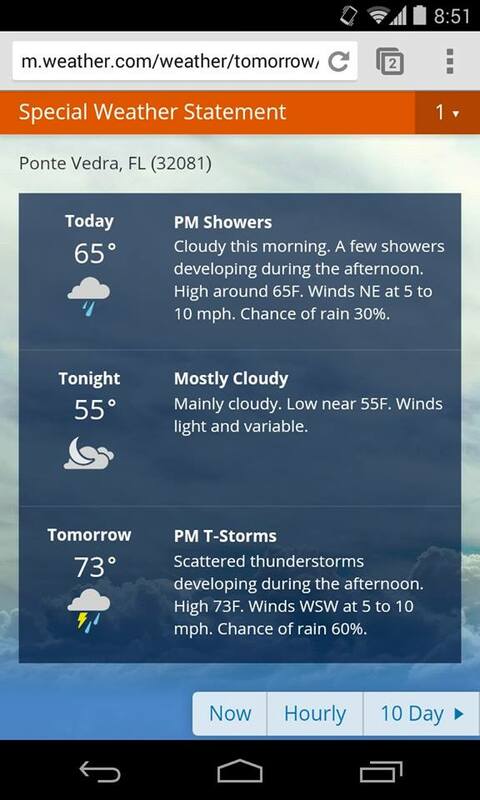 And I kept checking the forecast, which hovered around a 30% chance of rain on race day. On February 22, the day before the marathon, the forecast for the 23rd look promising. It looked like the rain would hold off until at least 2:00 p.m., and surely I’d be done running by then. The weather would be sunny and mild all morning – so I made a last minute decision to ditch the hat. In 2013, the start of the marathon was delayed because of traffic snafus. I got lucky and avoided this by taking a different route than most, and I arrived at Runners’ Village with time to spare. This year, I wasn’t quite as lucky. Runners were advised to take my “secret” route, which created a lot more traffic on this road than the previous year. I got there quite a bit later than I’d planned (like I said, pathologically unpunctual) and found my friends just as they were heading to our corral. There were plenty of Porta-Potties, but the lines were super long. My friend Angela and I decided to make a foray into the woods, where we found lots of other racers doing their business (including a very courteous gentleman who pointed at the spot from which he’d emerged and warned us NOT to go THERE). I ate my Gatorade Energy Chews and lined up with my friends. We started out as a group of 10 – 9 of us who trained together all season with the Galloway program, plus my sorority sister and guest poster, Shanin, who I hadn’t seen in about 20 years. Instead of lining up with a formal pace group, our friend and Galloway group leader, Mercedes, had offered to pace our group. Our goal was a 5:15 finish with 2:30/1:00 run/walk intervals. As I said, the weather was perfect. Most of us were in short sleeves and shorts/skirts. We lined up with over 5000 runners (both full and half marathon runners) and waited for the gun. We were in the third wave…and then we were off! One of the best things about The Donna is the massive crowd support. 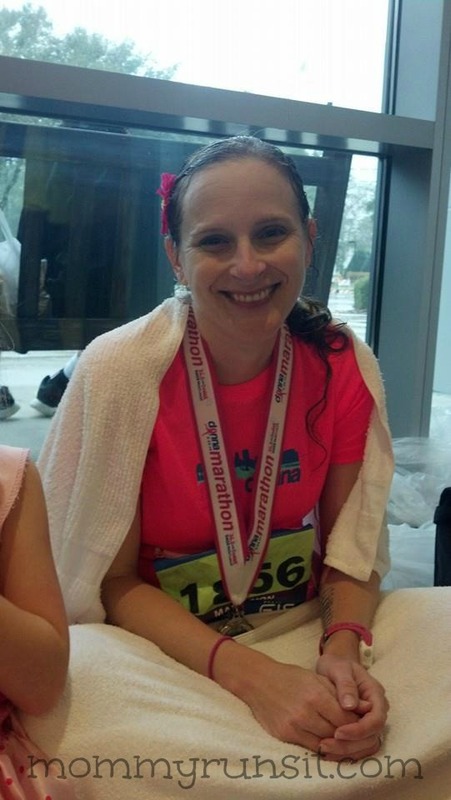 It’s the only marathon I’ve ever run, so I don’t personally have anything to compare it to, but lots of my fellow runners say that The Donna has the most enthusiastic and supportive spectators that they’ve ever experienced. 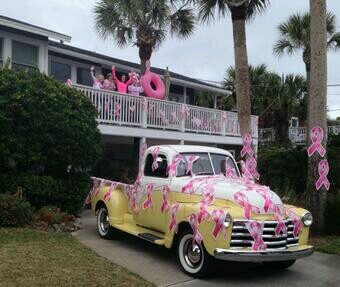 Right from the start, throngs of people, many in pink, lined the streets cheering, clapping, and holding signs. 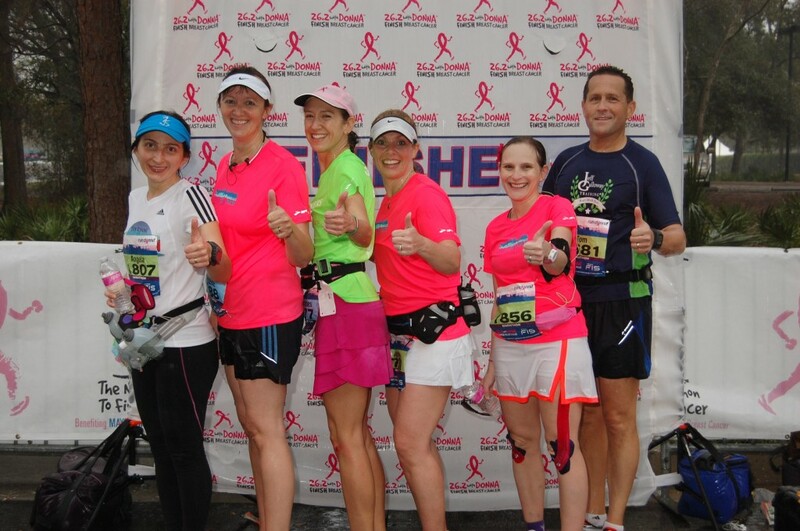 And the support continued throughout the entire course, with many spectators even thanking us for running the marathon and helping to finish breast cancer. It was incredible. Another cool thing is that race founders Donna Deegan, Tim Deegan, and Dr. Edith Perez run the marathon too. 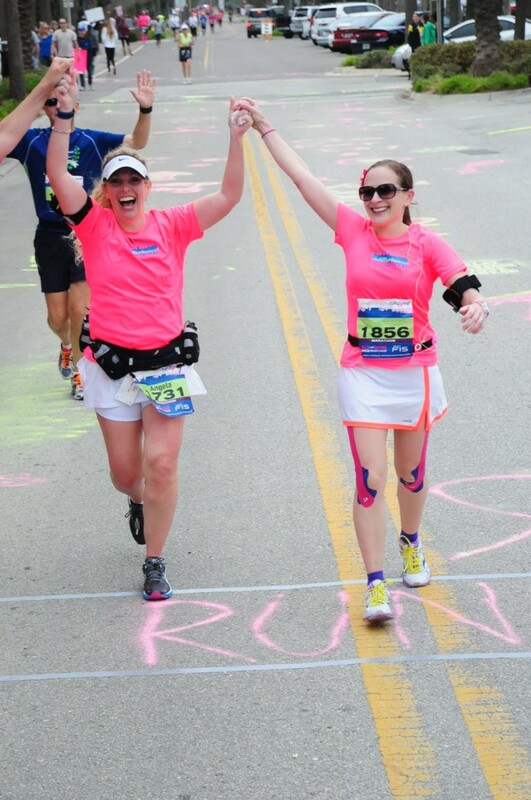 They stop to say hello, give hugs, and take pictures with runners and spectators. We passed them during our first few miles and shouted our hellos. 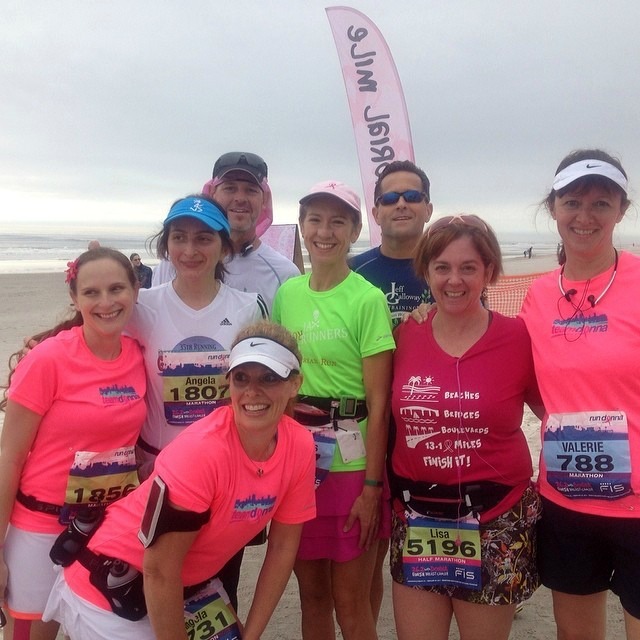 The first 6 miles of the course were on A1A and then through the streets of lovely beach neighborhoods. Some members of our group drifted off for bathroom stops during those first few miles, but we met up again as a group at mile 6. There were plenty of Porta-Potties along the course, some with no lines at all. 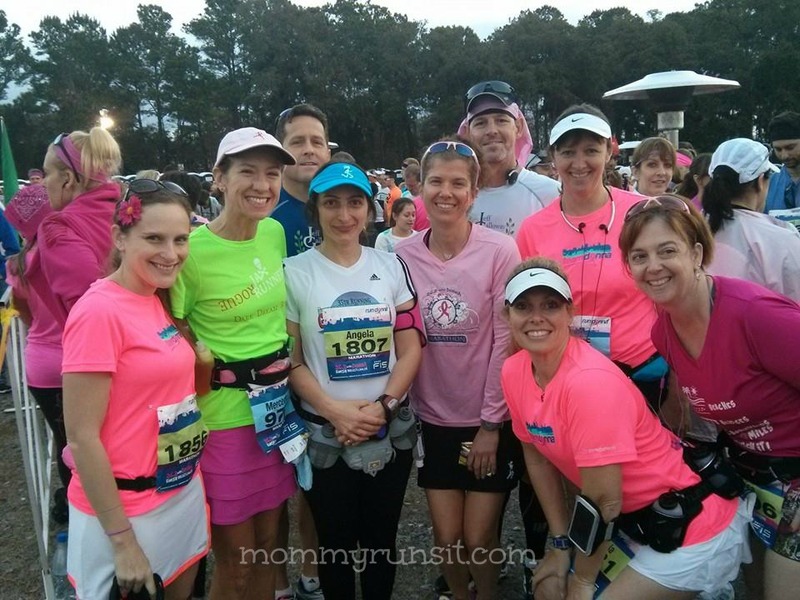 At mile 6, there was a whole row of Porta-Potties, so we all stopped for a bathroom break and to take a group photo. 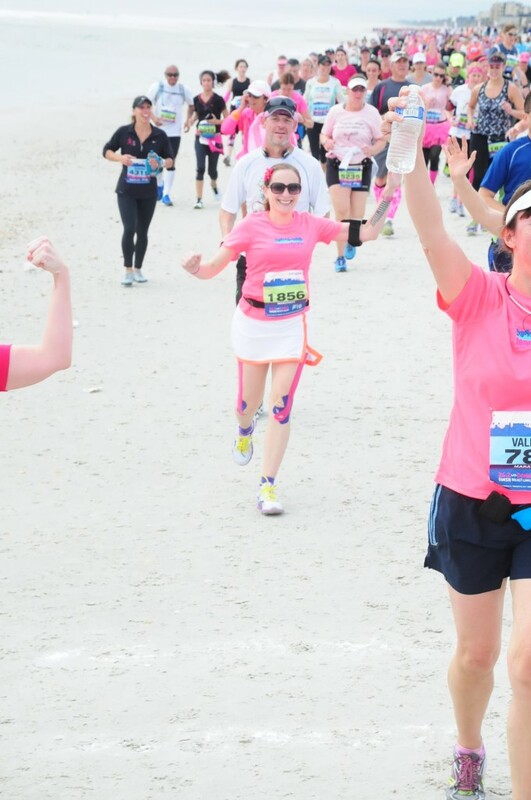 At mile 6, the course veered onto the beach. The sand was packed and hard, and the wind was manageable, so it was not nearly as difficult as it could have been (and as it was last year). A portion of the beach run is called the Memorial Mile, where people who have suffered from breast cancer are honored with large banners. 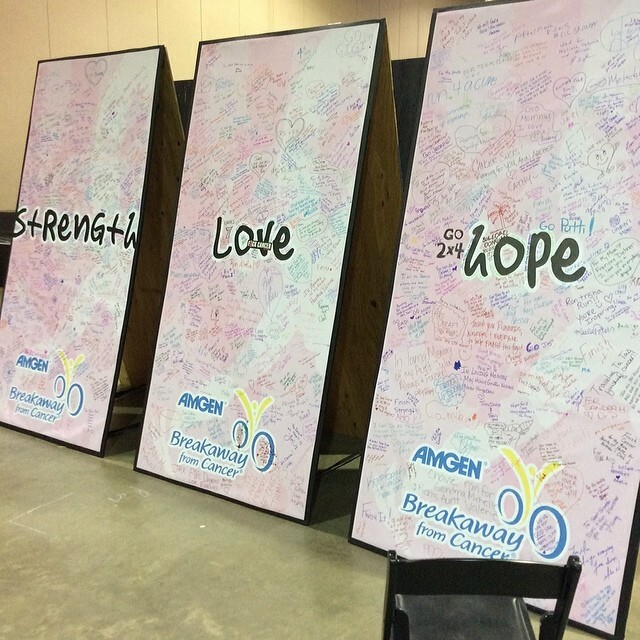 The banners are signed by expo attendees and are full of inspirational and beautiful words of support, love, and encouragement. 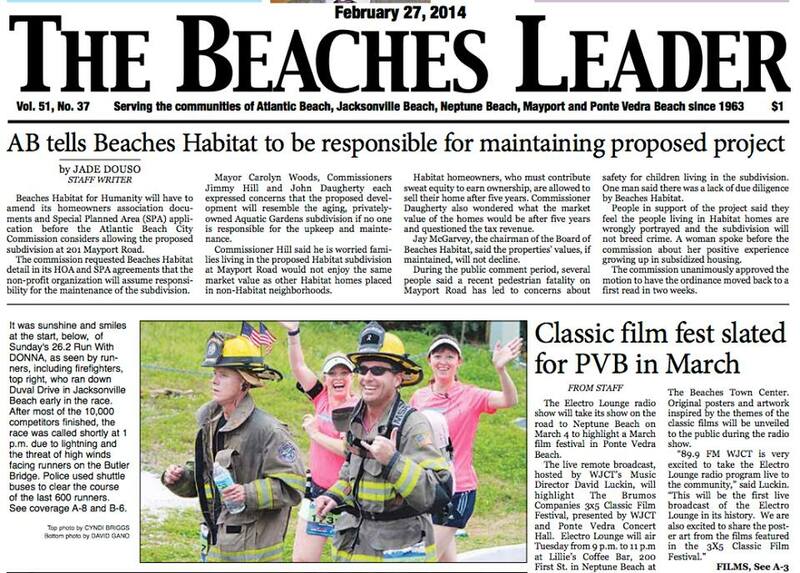 At mile 7, the half marathoners exited the beach. The full marathoners continued on until around mile 8.5 or so. At this point, I felt good. The pace felt okay and I was keeping up with the group, generally drifting toward the back of our pack, which is just my preference. I was taking small sips of water and/or Gatorade at each water stop, and I’d had my first GU. I’ll be honest – I still haven’t really figured out how to use my new Garmin all that well. In preparation for this post, I attempted to look at my splits. I didn’t have any luck. So since this post is already several weeks later than I’d planned, I’ll just tell you that the handy dandy online race results say that I crossed the half marathon point (13.1 miles) at 2:40:25. I was still hopeful that we could finish in under 5:30, but 5:15 was starting to look like a stretch. We took our second bathroom break right around 13 miles, and then we continued to run through more neighborhoods. The crowds weren’t quite as wild here, but there was still plenty of cheering and sign holding. This was when I started to feel the miles a bit. I was still feeling strong, but I was lagging behind the group a little. This is the only point in the marathon when I put my headphones on and listened to music, but I think it was for maybe 20 minutes at the most. My running buddies were going strong and having a great time, so there was plenty of conversation and laughter to distract me. Around mile 15, we began making our way back toward the beach. This is when I noticed that the sky was darkening. It’s also when I noticed that the event alert signs had changed from Green (Low) to Yellow (Moderate). I was a little nervous, but since the weather forecast hadn’t shown rain until much later in the day, I was hopeful that it would hold off. Around mile 17, we passed my dad and sister, who’d driven all the way from south Florida to cheer me on. Funny story – at the precise moment that I was passing, my mom called my sister’s cell phone, spoiling our photo opp. This is the best she was able to do. I think mile 18 is when I really began to tire. I stuck with my group, but I fell several paces behind them. One of our group members, Tom, hung back with me and helped me push through. At mile 20, we stopped to take a photo of us breaking through the ceremonial “Wall.” As you can see from the photo, our group had gotten smaller by then. But the 6 remaining members continued on to run the final 6 miles together. I think we stopped for our third and final bathroom break somewhere around mile 20. This is also when I noticed that the event alert signs had changed again, this time from Yellow to Red (High). It’s also when we began to feel the first drops of rain. A light sprinkle quickly turned into a full-on downpour. In a matter of minutes, I was soaked from head to toe. And since I’d left my hat in the car (grrr…), I was being pelted in the face by rain. It was tough to see out of my sunglasses, so I ended up holding them in my hand for the last few miles. Oh, hey, and did I mention that those last few miles are mostly uphill? This is not your ordinary bridge run. Around mile 23, you begin a very slow, winding incline up the on-ramp. It’s easy to get tricked into thinking that this is the bridge – but it’s actually just the ramp leading to the Intracoastal Waterway Bridge. The bridge is long (2+ miles long) and steep, and let’s just say that the long-awaited descent brought tears of joy to my eyes (or maybe it was rain – it was hard to tell). Our time on the bridge was eventful. By the time we neared the base of the on-ramp, I’d fallen quite a bit behind the group. I was still able to see my friends and to follow their run/walk intervals, but I was struggling physically (not with pain, just with overall fatigue), and I was just miserable in the rain. But our group leader, Mercedes, bless her heart, waited at the base of the on-ramp for me. She wanted the remaining 6 of us to finish as a group. So I sprinted ahead, caught up with the group, and began the long, slow climb. My time was somewhere around 4:45 at that point. I can’t quite remember when we saw the first bolt of lightning strike, but we were somewhere on the bridge. And that was only the beginning. There we were – on a bridge, soaking wet, in a lightning storm. Fun, right? We saw groups of volunteers huddled underneath tables. We saw marathon workers driving the opposite direction in a golf cart, on their way to pick up runners out on the course. And we saw that the event alert signs had been changed once again, this time to Black (Extreme). But we kept running. Tons of cars driving in the opposite lane on the bridge honked at us. I’m not sure if they were trying to show us support or to call us idiots for running on a bridge in a thunderstorm, but I’m going to think positive and go with the former. Somewhere along the bridge, I also quite randomly came across my cousin Sabrina. She was there with a group of volunteers who were right out there in the storm with us, cheering us on. She gave me a huge hug, which was exactly what I needed at that moment. I started trailing behind the group again, maybe by about a tenth of a mile or so. Tom stayed behind with me, but at the end I insisted that he catch up with the rest of the group. I think I just needed to do that last little stretch on my own. I finally exited the bridge and ran the rest of the way on blissfully flat ground. As I neared the finish line, I noticed that there were very few spectators. But then I saw my dad and my sister standing on the sidelines in their ponchos, ignoring the race officials who were telling them to get indoors. That was really cool. They also shouted to me as I passed by that my husband and kids were waiting indoors for me, which was a sweet surprise (I’d told them not to come, and I surely didn’t expect them to be there in such terrible weather). My friends were still a bit ahead of me, and I watched as they all suddenly stopped and gathered around someone on the ground. It was a little worrisome, but it turned out that *someone* had tripped just moments away from the finish line. It speaks a lot about our group that everyone stopped to help her. My amazing friends (Mercedes, Tom, Angie, Angela, and Valerie) all finished in 5:29 and change, meeting their goal of finishing before 5:30. I only missed the goal by a hair with a finish time of 5:30:10, beating my previous finish time of 5:34:44. As I crossed the finish line, I was handed a bottle of water. No medal. No Mylar blanket. Because of the storm, Runners’ Village was being packed up. I’d been given access to the VIP tent, but my dreams of post-race Ruth’s Chris were dashed. I couldn’t even get a bowl of soup. I found my medal and my friends, posed for a couple of pictures, and then was herded into the Mayo Clinic where runners, volunteers, and spectators were all being sheltered from the thunderstorm. My family was just inside the door waiting for me. I was soaked from head to toe, and I was freezing. I desperately wanted a Mylar blanket, but I was only able to score a couple of towels from the makeshift first aid room. I took off my wet shoes and socks, and I switched my wet shirt with my husband’s hoodie, which helped. He’d brought some food for me, including some chocolate milk. It was no steak, but it hit the spot. We took a shuttle to his car, then he drove me to the starting point to pick up my car. I blasted the heat and drove home, ready for a hot shower and a long nap. I later found out that the race organizers started shutting things down at around the 5:10 mark. At around 6:00, they shut the course down completely and shuttled everyone who was still running back to the Mayo clinic. Nearly 150 runners were unable to complete the marathon because of the extreme weather. Can you imagine how devastating that would be? Fortunately, all of them were still able to receive their finisher’s medals. 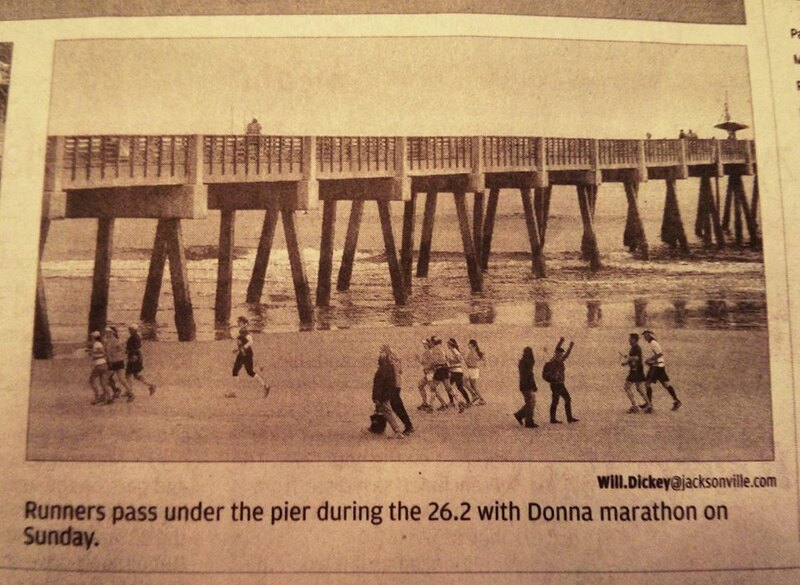 This was the 26.2 with Donna’s 7th year, and it was the first time they had to implement their emergency plan. All things considered, I think things went well. No one was injured because of the storm. Yes, those of us who finished in the rain were cold and hungry. But my goodness! We’re marathon runners. We can handle a whole lot more than that. So in summary: I had a really fun run with a great group of friends. The camaraderie and crowd support were phenomenal. To anyone reading this who came out to cheer us on – thank you! You helped more than you know. With the exception of the dreaded bridge, the course is mostly flat and very pretty. The rain sucked, but I’m proud of the fact that I kept going even when I was soaked and miserable. I achieved a new PR, and I now have a second marathon medal to add to my growing collection. Bonus – we got to be a little famous! 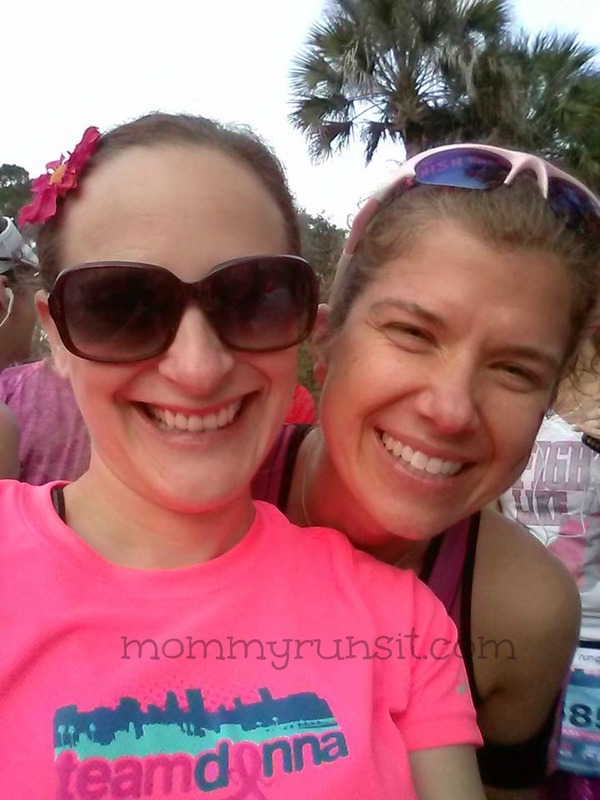 If you’re looking for a fun run on a beautiful course (and if you can deal with slightly unpredictable Florida weather), join us on February 15, 2015 for the 8th annual 26.2 with Donna! Did you run the Donna with us? How was your experience? Have you ever had to leave a race because of an emergency situation? Wow…congrats on finishing and on the PR! I don’t know if I would’ve made it through if it hadn’t at least been warm out. I’m a wimp in the cold. Great recap! Congrats on finishing in that weather! 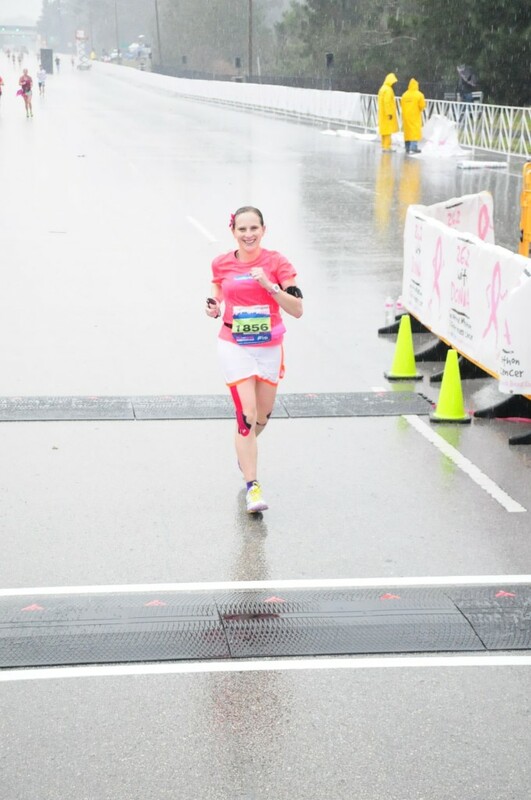 I just ran the Love Run Half Marathon in Philly a few weeks ago and it was basically a freezing cold monsoon. Somehow I was able to run through it for a few hours and finish with a huge PR! That medal is officially my favorite medal now because I really earned it! It was lots of fun! 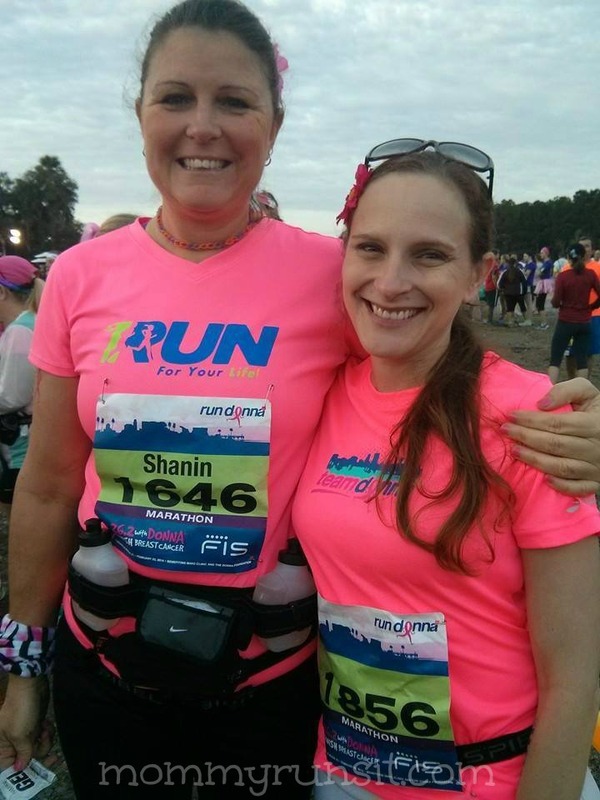 I ran almost the whole thing by myself last year, so running with friends was so awesome. I don’t mind running in the rain, especially if it cools you off – but this was crazy heavy rain! Well Said!! I look forward to running with you next year!! 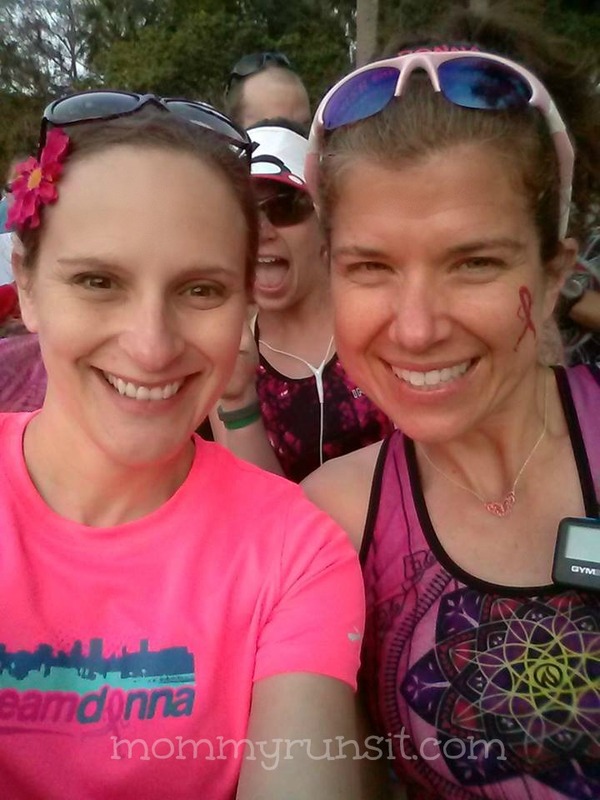 5:15 or under next year…we’re going to crush it! !